Pizza Elbow JapanThe black and white image bottom right (Oobuchi, 2011) labelled "inside the mind" shows a network of associations between words. At the top is Pizza which rhymes with the Japanese word for knee (hiza) which is often associated with hiji elbow. In typical logo centric fashion the textbook, written by a Japanese psychologists (presumably influenced by Western psychology), is claiming that there is an indirect link between pizza and elbows due to their linguistic association. It is my view that the Japanese mind may in fact have a stronger network of visual associations shown bottom left such that I hypothesise that pizza would be felt to visually resemble the Japanese flag, which is in turn associated with a map of Japan so, there is an indirect visual association between pizza and the shape of the Japanese archipelago. 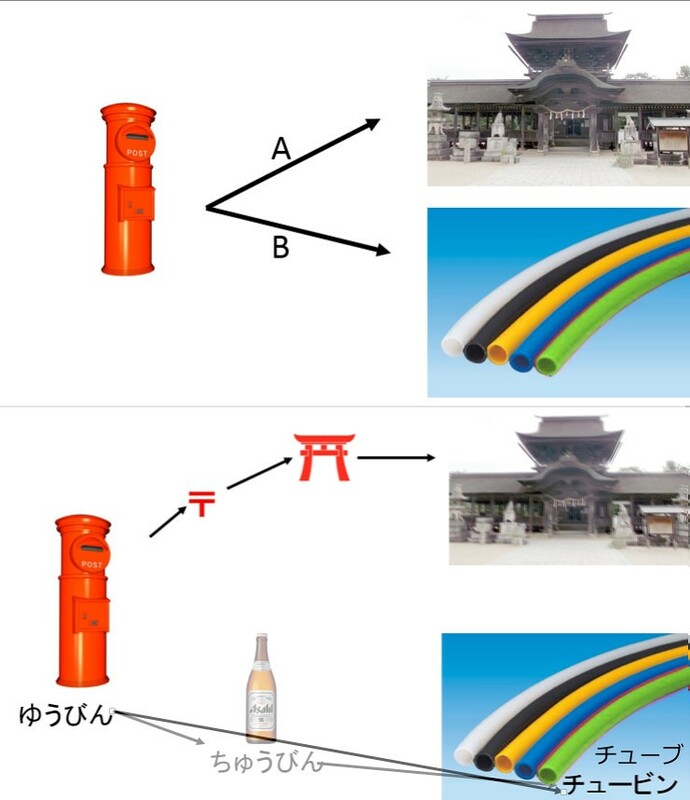 I hypothesize that these visual associations would be stronger than the former linguistic associations among Japanese compared to Westerners, but this would be difficult to prove since the same linguistic associations could not be made. Instead of the elbow, an anglophone might be asked if they associate the pizza with a fridge symbol using the association by rhyme of pizza -> freezer and the association by first letter and physical similarity freezer -> fridge. But then pizza is kept in a fridge so even if anglophones chose it they might be doing so due to holistic associations of visual contiguity. I think I would need to use Japanese subjects and some sort of priming manipulation of culture. The pizza elbow connection is used by Japanese school boys in a sort of trick where the victim is asked to say pizza ten times before being asked the name of the elbow, which instead of calling a hiji (elbow) is inclined to call a "hiza" having been influenced by the repetition of pizza (piza in Japanese). I think that this trick works also shows that Japanese are fairly insensitive to phonetic semantic connections. If I were told to repeat "pea" ten times I would not call my elbow my knee. at the three minute mark in a video on robot staffed hotels in Japan by Motherboard. 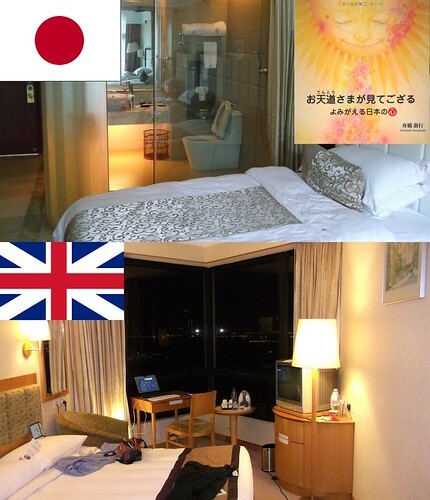 "Our hotel has the heart of Japanese hospitality (omotenashi no kokoro) and must therefore be staffed by humans. Our staff must be human because we behave proactively anticipating the thoughts and needs of the customer. " 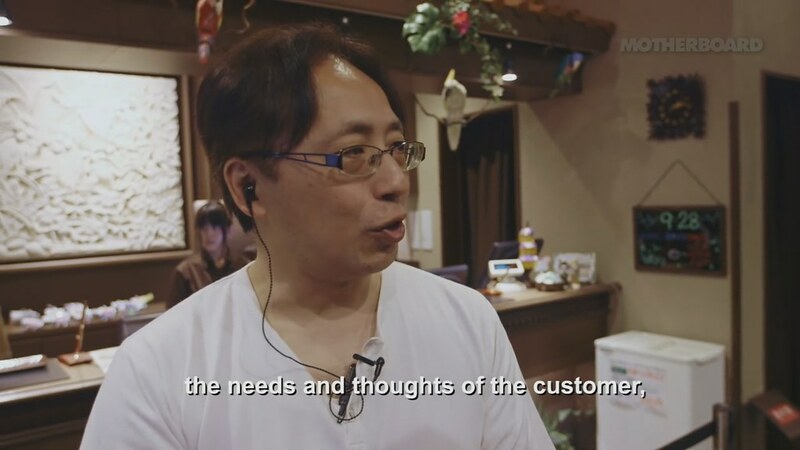 The Motherboard translation is slightly off the mark since the hotelier does not "respond" to the needs and thoughts of the customer but pre-empt -- saki mawari, literally go around in front of -- them. If it were merely a case of "responding" to the needs and thoughts of their guests, the hotel could wait for the guests to express them verbally, and use robots, or untrained staff working to a manual, as is the case in Western style, customer makes overt choices, "help yourself" (Doi, 1973, p.13) hospitality. Japanese hospitality is, when it works, a sort of "mirror dance" (Krieger, 1983) where the providers read the minds of their customers via their faces and behaviour, adjusting their own behaviour on the fly accordingly. Contra what I have written elsewhere however, this hotelier seems to be implying that the thoughts of the customer are not expressed by their behaviour but come afterwards, perhaps in linguistic form. At its most effective, Japanese hospitality should preempt, and even prevent, the arrival of such thoughts by satisfying the need before the thought arises. 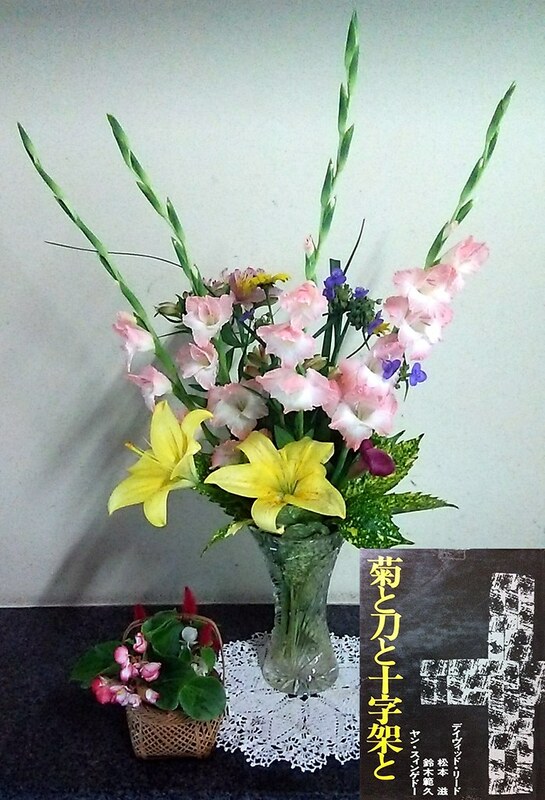 The manager also mentions however, a "heart" (kokoro) that exist prior to the thought, at least in the hotelier. This Japanese heart has traditionally been refereed to as a mirror such as in the preface to the record of ancient matters (Kojiki). Doi, T. (1973). The Anatomy of Dependence. Kodansha USA. Krieger, S. (1983). The Mirror Dance: Identity in a Women’s Community. Philadelphia: Temple Univ Press. It is quite difficult to get objective data about the well being and health of a nation. In research on perceived well being (Cummings, 1998) based upon Licket scaled linguistic tests developed by Diener (Diener, Emmons, Larsen, & Griffin, 1985), the Japanese are found to be among the most unhappy people in the world. There are a number of reasons for this. The reference group effect (Heine, Lehman, Peng, Greenholtz, 2002) encourages respondents to compare themselves to their ingroup peers, so if those surrounding the subject are happy it is going to be difficult to rate oneself as of above average well-being or happiness. And further, while Asians tend to be humble, Westerners tend to "self-enhance." Alas however, despite the lack of reliability of self-report measures, the prime minister of Japan (Abe, 2013) is alarmed by the fact that Japanese children do not, like American children, self-report that they are "proud of their country. 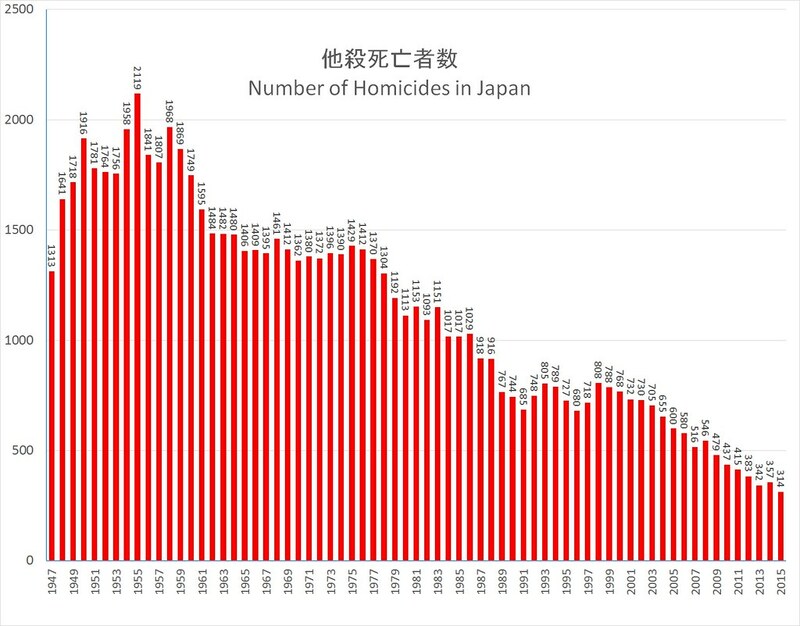 The lack of pride of the Japanese is seen as cause for concern. That 35.4% of the Japanese report themselves to be in the top two categories of a five point scale is within 4.6% of the level that it should be assuming realism and an honest, parsimonious, even distribution of people responding with each of the five categories. More than 80% of people from the top four anglophone countries, however, find it meaningful to say that their health is "good" or "very good". What does "good" or "very good" mean to these people? It is clearly not an expression of the true state of their health. I suspect it is self encouragement, or auto-eroticism as Derrida (1976) likes to call it. In the Christian tradition pride was thought to be the origin of or equivalent to sin（Hastings, Mason, & Pyper, 2000) but these days positivity is king. All these self-report scales should indicate is that the Japanese do not lie about their happiness and health. 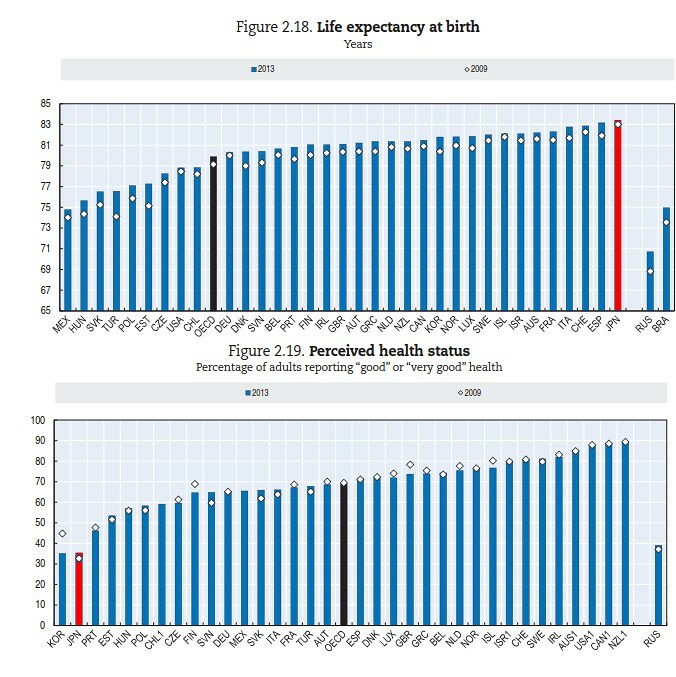 Alas there are many Japanese who believe the data, and believe that they are as a nation, living a long time in poor health compared to other nations. Concerned at these results Japanese children, and adults, are being encouraged to rate themselves more positively. The whispering is being imported to Japan. Abe. S., 安倍晋三. （2013）. 新しい国へ 美しい国へ 完全版 （『美しい国へ』増補・再編集・改題書版）. Tōkyō: 文藝春秋. Derrida, J. (1976). Of grammatology, trans. G. Spivak. Baltimore: Johns Hopkins University. Hastings, A., Mason, A., & Pyper, H. （2000）. The Oxford Companion to Christian Thought. Oxford, England: Oxford University Press. Heine, S. J., Lehman, D. R., Peng, K., & Greenholtz, J. (2002). What's wrong with cross-cultural comparisons of subjective Likert scales? : The reference-group effect. Journal of personality and social psychology, 82(6), 903. Westerners have a tendency for self praise. Indeed thought, which has been shown not to be will (Libet, 2009; Nisbett and Wilson, 1977) may be a stream of self comforting, justifications (Haidt, 2001), or even a negotiation" (Rochat, 2009) or sexual self-stimulation (Derrida, 1976) that we whisper and of which we are ashamed (Quran 50:16). Whispering in the mind is similar to Keynesian macroeconomic stimulation of the fiscal kind. Westerners tell themselves that "I can do it," "I'll will win" and motivate themselve to do just that. They feed themselves empty simbols, that otherwise have exchange value, to get a postive feedback loop going. Central banks print money, symbols that otherwise have exchange value, to get an economic positive feedback loop going. Both work in the short term but may become an addictive maelstrom of self-stimulation in the longer term. With regard to the mental self-stimulation it has been shown that the the Japanese probably do not do it, at least nearly so much (Kim, 2002; Heine et al., 1999). Japanese sports persons refrain from self praise even when they win. This is not to say that there is not a Japanese equivalent to self-praise. 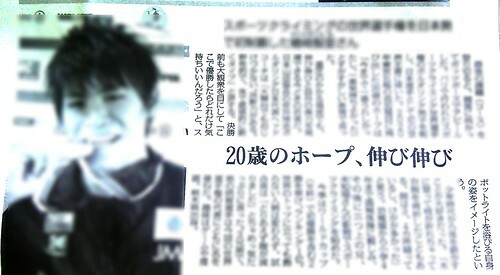 The sports person picture above in the Yamaguchi Newspaper indulged in Psychological Keynsianism Japanese style. Before the final of his rock climbing event he brought forth an imagine in his mind of himself, winning the event in the spotlight in front of the massive crowd. This image helped propell him to his win, with unconstrained enthusiam (nobi nobi 伸び伸び). One possible advantage of the Japanese style of self-stimulation is that it may not require comparison (Yuki, 2003). Linguistic signs always exist and have meaning in distinction to other signs (De Saussure, 2011; Maruyama et al., 1993, p19). "I will win" implies someone will loose. "I am great" implies, if "great" is to have any meaning, that someone else is not great. Unless there is to be rampant inflation some nefarious technique of maintaing the myth of 'everyone is better than average' must be brought into play. This is often achieved for instance by the negative evaluation of outgroups (Said, 1979; Tajfel and Turner, 2004). British people can be all "great", because orientals are all "savages". British people could all be rich because they took wealth from the rest of the world. The Japanese are even better than Americans at maintaining a myth that everyone is better than average (Hamamura, Heine, & Takemoto, 2007). Their technique of just imagining the beauty, however, does not necessarily require downward comparison. In the case of the sportsperson above it is true he imagined himself winning but the important thing was that he was in the spotlight. Downwards comparison was not present nor necessary. Indeed conversely it may be the case that Japanese psychological Keynsianism can feed off positivity, such that Japanese like to imagine, and photograph, themselves alongside the triumph and beauty of others. Japanese tourists, armed with selfie-sticks are masters at 'basking in reflected glory' (Cialdini et al., 1976). Japanese economic self-stimulation has generally taken the form of public works projects to construct roads, and various "boxy" (hakomono) infrastructure. Such public works were generally funded by loans. Perhaps Japanese sports person can only pump themselves up with images of victory if they accept that there will be a payback time (perhaps at the moment of victory, when the spotlight is not all that enjoyable after all). 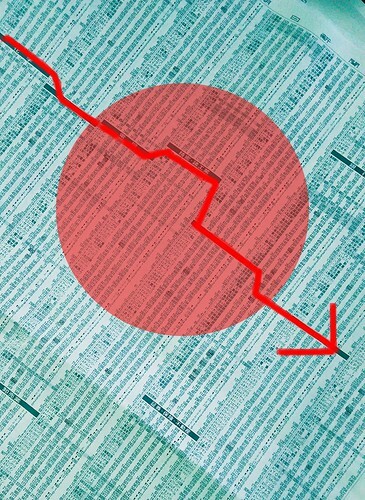 Recently, both on the psychological and economic front however the current prime minister of Japan is encouging the Japanese to praise themselves (Abe, 2006), and resorted to symbolic, fiscal stimulation of the Japanese economy. The Bank of Japan is printing yen and purchasing Japanese government bonds. The Prime Minister also espouses an increase in Japanese millitary strength. It seems to me that simbolic self-stimulation, without inflation, and violence go hand in hand. I think that this physical recreation of the Western mind in the global pollitical economy is the 'unveiling' that we need to avoid. Abe, S. (2006). Utsukushii kuni e [Towards a beautiful country]. Tokyo: Bungei Shunju. Cialdini, Robert B., et al. "Basking in reflected glory: Three (football) field studies." Journal of personality and social psychology 34.3 (1976): 366. De Saussure, F. (2011). Course in General Linguistics . New York, NY: Columbia University Press. Hamamura, T., Heine, S. J., & Takemoto, T. R. (2007). Why the better-than-average effect is a worse-than-average measure of self-enhancement: An investigation of conflicting findings from studies of East Asian self-evaluations. Motivation and Emotion, 31(4), 247-259. Heine, Steven J., Darrin R. Lehman, Hazel Rose Markus, and Shinobu Kitayama. "Is there a universal need for positive self-regard?." Psychological review 106, no. 4 (1999): 766. Libet, B. (2009). Mind time: The temporal factor in consciousness. Harvard University Press. 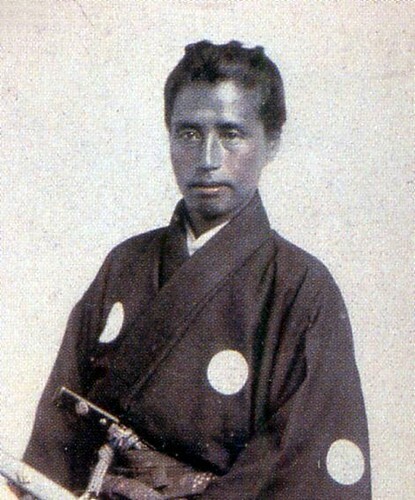 Maruyama, M. et al. 丸山圭三郎, 行人柄谷, 健二立川, 秀岸田, & 芳郎竹内. (1993). 文化記号学の可能性 (増補完全). 夏目書房. Nisbett, Richard E., and Timothy D. Wilson. "Telling more than we can know: Verbal reports on mental processes." Psychological review 84.3 (1977): 231. Said, E. W. (1979). Orientalism. Vintage. Image: Deliberately blurred photo of an article in the Yamaguchi Newspaper from October 2016. The Shinto shrine at which my wife and I were married gave us a wedding oath in which it was written that we were to remain "different bodies, but now with one heart" (異体同心). This presents an interesting contrast with the conception of marriage as becoming one flesh in Genesis 24. "21 So the LORD God caused a deep sleep to fall upon the man, and he slept; then He took one of his ribs [sides] and closed up the flesh at that place. 22 The LORD God fashioned into a woman the rib which He had taken from the man, and brought her to the man. 23 The man said, "This is now bone of my bones, And flesh of my flesh; She shall be called Woman, Because she was taken out of Man. 24 For this reason a man shall leave his father and his mother, and be joined to his wife; and they shall become one flesh." I know that there is a Nacalian transformation to be had here -- well it is obvious and overt -- but I don't know what it means to become "one flesh." In the West God, in one of his persons, listens and for the faithful becomes a comforter (paraclete, generalised other, impartial spectator, super addressee) shared by all, whereas visual perspectives are "dialogical" in the Bakhtinian sense, always polysemous, seen from the point of view of others, so that my face is not my self (Nishida), but "a face for a face" (in Nacalian inversion of Mori's "you for you"). While visuality in the West remains polysemous and subjective in general, among married couples ones appearance may become primarily above all for the eyes of ones spouse. In Japan however the kind old sun is watching, and presents a gaze apart that his shared by all. 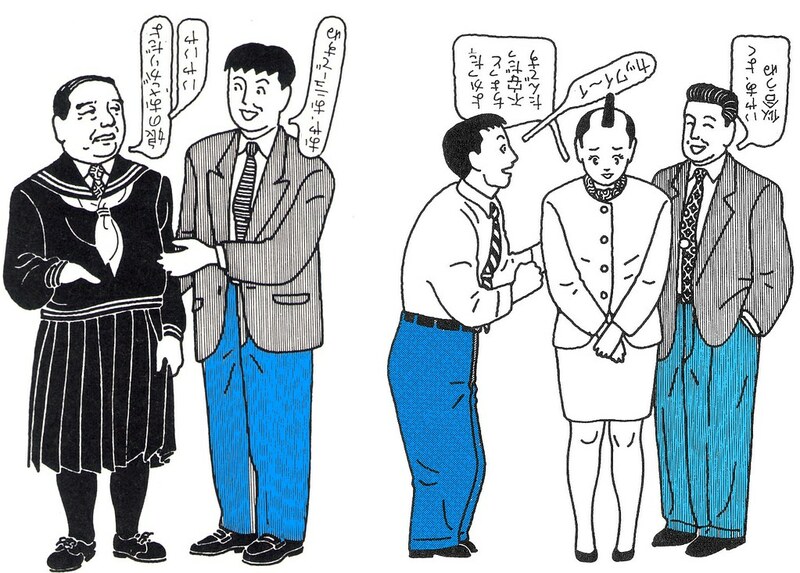 However language remains polysemous so that in general the Japanese first person pronoun is as Arimasa Mori says no more than a "'You' for a 'You.'" However among Japanese married couples perhaps, the Japanese linguistic superaddressee becomes ones spouse. In each case, therefore, perhaps "our better half" takes the place of the perspective not occupied by God. I can see how that might work to make Western couples one flesh (c.f. Terrence Malik's ""We were a family... Each standing in the other's light.") but it is pretty strange to me that a Shinto Shrine might, under this interpretation, call the self-narrative the heart. But then again, Shinto has become very wordy post-Meiji, modelling itself upon Western monotheisms and handing out oaths like this, and may even have forgotten, like Prime Minister Abe, and Seiichi Tsuruta (鷲田清一) that the Japanese heart is a mirror. In this morning's Asahi Newspaper Professor Tsuruta came back to his senses. In today's Asahi Newspaper the philosopher Seiichi Tsuruta, who is usually very "Western" in his belief that the self is essentially linguistic, returned to his senses and chose for today's "words of the moment" (ことばのおりおり") the following excerpt from the poet Hiroshi Nagata who died, at age 75, in May last year. People learn words, and lose happiness. They become sage with same amount of sadness. I often find it difficult to persuade people that I came from the country of words, to the land of light, at least partly because there are so many brilliant Japanese novelists and poets. It seems to me however that so many of the best Japanese novelists and poets, and the most famous haiku poetic style -- aims to take us with words away from them, back to the things that say nothing. In his acceptance speech for the Mainichi Newspaper poetry prize as summarized in the article from the same newspaper above, the poet describes his art in the following way. "Through my art, the basis of my life has become living with the seasons, seeing things, feeling them, thinking them, and this has allowed me to see my environment (風景 scenery) in a different way. By this means I have been moved ever more profoundly by closeness or affinity expressed by the trees, flowers, birds, earth, water, sunlight, the colour of things that live the power of the seasons along side with us. I think it is through the amazing affinity and closeness of these things that say nothing that people are given life and saved. Rev Joshiba's essay on guilt and shame is a good summary of the various theories regarding their difference. He mentions one author, likewise a Christian, who shares a similar appraisal of Japanese culture to myself. 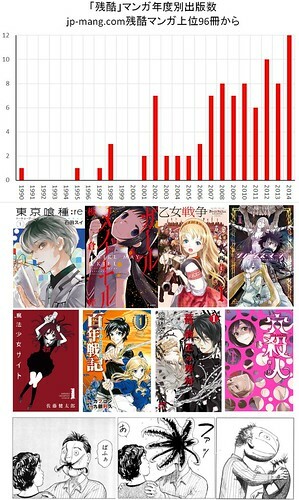 Joshiba summarizes  鈴木範久が『菊と刀と十字架と』で指摘した点はその意味でも興味深い。鈴木はそこで、日本は主として生け花・日本料理・和服・絵画など視覚型文化を発展させてきたが、恥は「見る・見られる」という視覚を前提とすると言っている（p50-51）。 In "The Chrysanthemum, the Sword and the Crucifix", Norihisa Suzuki makes an interesting point. Suzuki says that the Japanese have a developed a visual mode of culture in their flower arrangements, cuisine, clothing, and pictorial art and shame assumes a the visual sense of seeing and being seen （p50-51）. Quite so. Vision is no more external than language but hearing oneself "whispering" (which is what we now know linguistic thought to be) is worse because it hides its externality more effectively, and always makes contrasts, slagging off other people, groups and things, as I am doing now.